This year we have tried to raise awareness of how easy it is to fall into debt. We released Diagnose Your Debt, a debt test that asks you a series of questions based on the most common debt warning signs in order to determine how well you are managing your finances. We also published guides on preparing for unexpected expenses because you never know what life could throw at you. Following on from our work earlier this year we have now released our latest project, An Unfortunate Week. It’s an interactive guide showing hypothetical examples of someone subject to bad luck in the week running up to payday. An Unfortunate Week is an eye opening piece that we hope will raise awareness of debt issues and stress the importance of savings. 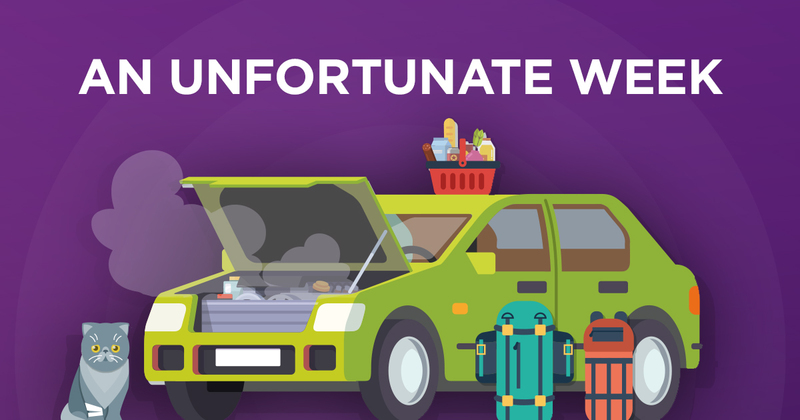 Have you ever had a string of bad luck where nothing seems to be going in your favour? We all have at some point, but in some cases a bit of bad luck can have disastrous consequences. If you don’t have any savings available and your car breaks down, this will cause some degree of financial distress. If at the same time your child brought home a letter for a non-uniform day with very little notice and you had to purchase a new outfit or your pet all of a sudden fell in and you had to take it to the vets, this would deepen the distress and might cause problems. When bills start to accumulate and you are short on funds, a lot of people turn to credit and then problems start to worsen even further. We’ve put together An Unfortunate Week to show how easy it is for bills to crop up and how easy it is to find yourself in financial difficulty unexpectedly. We hope it helps emphasise the importance of sorting your finances out before a problem arises and creating an emergency fund just in case. In light of our latest project we thought it would also be beneficial to share some tips on how you can handle unexpected and immediate costs should anything happen. Payment breaks. If you are struggling to make ends meet talk to your creditors and explain your circumstances. Ask whether it would be possible to take a payment break but assure them it’s only temporary. Being upfront with your creditors will often benefit you, they are more likely to co-operate. Look at cost cutting activities. Is there something you could give up or cut back on to raise money for something else. For example could you reduce the food shopping bill for this month and be creative with some of the tins in the cupboard? If you need to extra cash to cover unexpected costs, look at whether you could make cut backs on other areas. Work out when your bills are due. Is there are leeway? Do you need to pay them immediately or can you pay them a few days later than usual without incurring any extra charges. Check the dates of your bills and find out when they actually need paying – you might have a direct debit set up to make a payment on the 15th but upon checking your statement you might find your bill is not actually due until the 30th of each month. This gives you more time to save up the money you need. Prioritise payments. If you can’t afford to pay everything one month, prioritise payments. For example your rent or mortgage, council tax, TV license and utility bills are very important to pay and missing these could have great consequences, but delaying payment on your TV package won’t have as much of an effect. If you find yourself in financial difficulty and are not sure where to turn, we offer free debt advice and support. We will look through your finances and help you find a solution that suits you.